Our special guest will be Nancy Richwine from Kalispell. Nancy is this years featured quilter for the Stray Threads Quilting Guild in Woodenville, WA. Their quilt show is this month and since Nancy will have her quilts boxed up to hang in the show we invited her to share them with us. So come join us for tea, treats, fellowship and a wonderful trunk show. 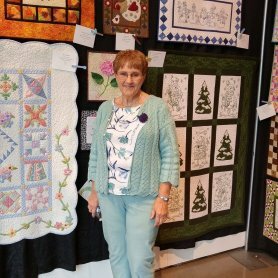 Here is Nancy at the Woodenville Quilt Show with her quilts!